Oh New York Times, how I love you. I adore your up to the minute news coverage, your style section, and your crosswords. I love Nicholas D. Kristof, the Critical Shopper, and of course Mark Bitman. 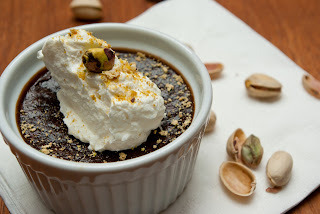 And now I love Melissa Clark, for bringing this recipe for silky, rich, decadently fabulous, chocolatey heaven on a spoon into my life. Ohhh heavenly heaven. To my loved ones, take note: if you ever have to deliver bad news to me, this is a magical blow-softening elixir. It's impossible to be sad or angry while devouring this dessert, it's just too lovely and wonderful. I made a few tweaks here and there to suit my tastes and what I had on hand. I didn't have any foil so I baked these uncovered and they were totally fine. I cut down on the amount of sugar ever so slightly as I like my chocolate desserts to be really chocolatey but not agonizingly sweet. I also found they didn't need quite as much time in my oven (only about 30 minutes). Preheat the oven to 325F. In a medium frying pan, toast the pistachios over medium heat for 3-5 minutes. Set aside to cool. Once cooled, transfer the nuts to a food processor along with the icing sugar and salt. Pulse until the mixture is fine but still grainy (the NY Times suggests "damp sand" as a reference). Scoop out about 1/4 cup of the sugar and pistachio mixture and set aside as a garnish. In a medium pot over medium-high heat, bring the milk, cream, and pistachio mixture to simmer. The NY Times calls for letting the mixture simmer for 5 minutes and sit for 20. I was too eager to get to the tasting part of the recipe so I split the difference and simmered it over low heat for about 12 minutes. Place the chopped chocolate in a large bowl. Strain the milk and pistachio mixture over the chocolate, using a spatula to smush the pistachio mixture into the sieve and extract as much flavour and liquid as possible. 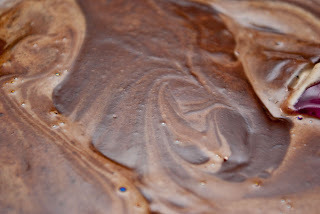 Whisk the chocolate and milk until all the chocolate has melted and the mixture is smooth. 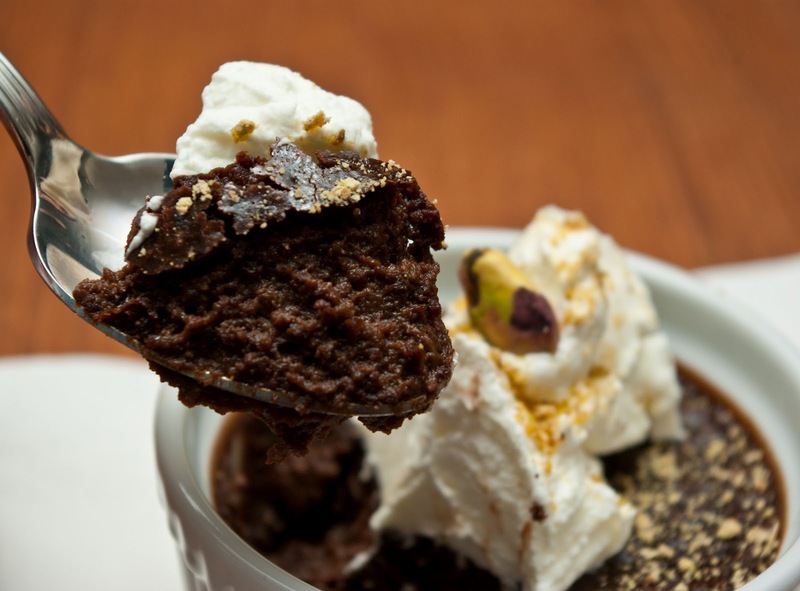 Resist the temptation to bathe in this silky, chocolatey concoction. In a separate bowl, whisk together the egg yolks, 1 tablespoon of sugar, and a pinch of salt. While whisking, pour the chocolate mixture into the egg yolks and whisk until combined. Boil a kettle of water and arrange 6 ramekins in a baking dish. Divide the chocolate mixture among the ramekins and fill the baking dish with hot water so that the water comes about halfway up the side of the ramekins. Bake until set but still slightly jiggly, about 30 minutes. Remove from the oven and let cool. Cover with plastic and refrigerate until firm (or until you can no longer wait for a taste). To serve, combine the whipping cream with 1/2 tablespoon of sugar and beat until soft. Top each ramekin with a dollop of cream and dust with the reserved ground pistachios.